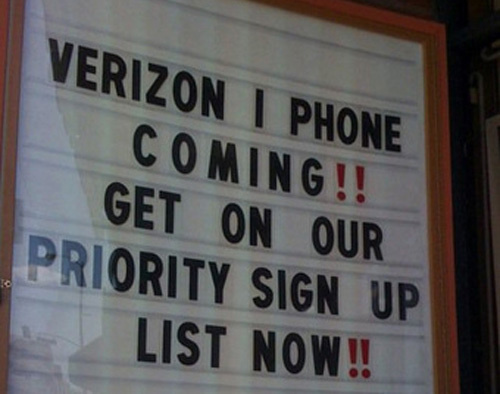 According to Bloomberg, Verizon will begin offering the iPhone in January. That’s according to two unnamed sources who are “familiar with the plans,”. No other details were given. It fits with what we’ve been hearing for the last few months. 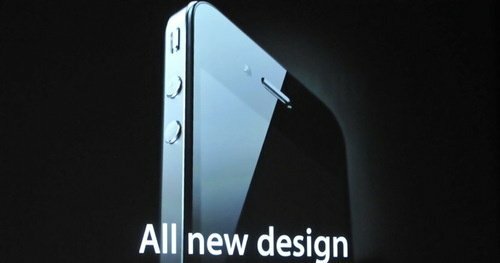 No one knows yet if it will be new hardware or just a CDMA iPhone 4. AT&T and Apple’s exclusivity agreement should be running out around January, so that fits. It would also let Verizon show off the deal at CES. I guess we will find out soon. If you were stoked about getting yourself a white iPhone 4, but don’t want to wait until late July, you can always opt to build your own. Engadget has done just that. 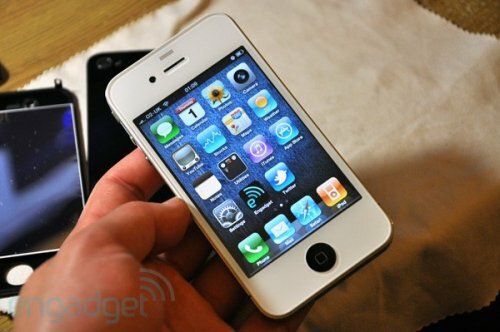 They have assembled a white iPhone 4 with third-party parts and it looks just awesome. Sure, it’s missing an earpiece grill, lens cover, LED diffusor, and a white Home button, but it’s pretty cool. Is there anything that the iPhone can’t do? The latest odd use for the iPhone is to use it as a teleprompter. The Prompt-it kit will let you set up your iPhone as a mini-teleprompter, so you can read your lines, while still looking at the camera. Just like a news anchor. Apparently it’s good for reading a speech when you’re on your laptop’s webcam, but if you are on your laptop, why not just put the lines on your laptop’s screen? It’s pretty neat, but not really practical. As you have heard by now, iPhone 4 owners are having reception issues when the phone is held in a certain way. 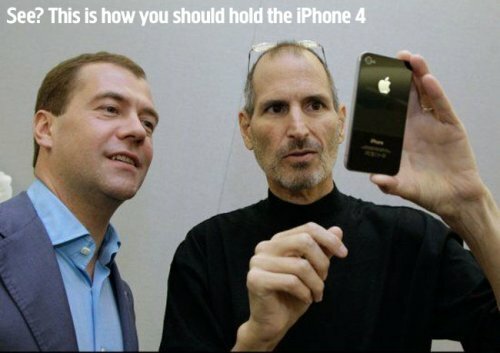 Apple released an official statement which basically told users not to hold their iPhone 4 in this way. Then Steve laughed and went back to counting money. When Rory Sinclair emailed Apple’s CEO, Steve Jobs, he was told that he was holding his iPhone 4 wrong. Full exchange below. Some stores have already sold out of iPhone 4s before the end of the day. Nine of 20 Apple stores had already exhausted their stock in the morning, and all others are expected to clear theirs by the end of the day. Earlier iPhone launches have usually taken a full weekend before significant sellouts, so this is really saying something. According to one analyst, assuming Apple reserved about half its total launch supply for those who hadn’t pre-ordered, we can expect to see at least one million and as many as 1.5 million iPhones sell this weekend. The low end would match Apple’s previous best sales, with the iPhone 3GS. They may just hit a new record. If you are waiting for a white iPhone 4, you may have quite a wait. 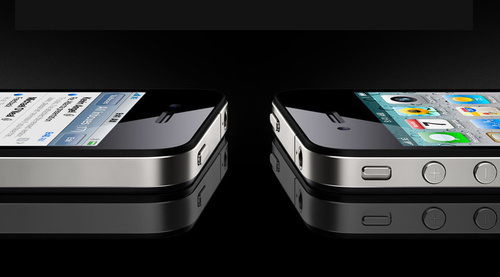 Apple had announced the iPhone 4 in your choice of black or white. Then suddenly there was no availability of the white model. Now, Apple says you have to wait until late July. When you pay Apple prices for the latest shiny gadget, you are going to want some insurance to protect your investment. 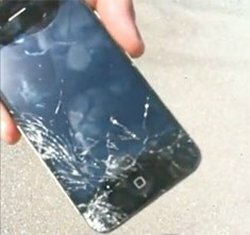 MobileProtect is the only company to offer insurance for the iPhone 4 right now, when it comes to cases of loss or theft, water or other liquid damage, accidental damage and out-of-warranty failure. It’s a great idea. Especially in this economy. It will cost you $11.99 a month for the coverage. It’s probably only necessary for the more accident prone among us. This is a bit odd, but it’s still great news for all those who pre-ordered their iPhone 4s. According to an email from Apple, delivery “will occur on June 23rd.” That’s a day early. See that. You should have pre-ordered. Apple never really wants to tell us how much RAM is in their devices, but MacRumors is now reporting that the iPhone 4 will have 512MB of RAM. That’s twice what the 3GS and the iPad have and is more on par with it’s competitors like the Evo 4G. That’s good news for everybody. The iPhone 4 will also have the same processor as the iPad, so if this is true it will also have twice as much memory. Developers will be able to keep more data cached and manage graphics changes more effectively, and for you and me that means browsing without frustrating refresh times and smoother multitasking. AT&T can’t deal with iPhone 4 orders. After shutting down their online sales system following several security problems, they are giving up in order to avoid any further trouble. Seems like their computer systems are in real trouble thanks to the demand surge. This comes after only one day of pre-orders. The demand collapsed both AT&T and Apple servers, which were unable to take orders, were taking multiple incorrect orders, placed reservations that didn’t reserve anything, and had physical stores closing or having to take orders with pen and paper. The problems also involved a security breach, with people trying to get into AT&T only to get into the wrong customers account. If you’ve been drooling over the new iPhone, you’ll still have to wait until June 24th to actually get the Phone 4 in your hands, but you can place a pre order at Best Buy starting June 15th. That’s good news if you don’t want to pick one up at Walmart or the Apple Store. So the only thing left to decide is whether you want it in black or white. How many of you will be hitting up Best Buy stores tomorrow? That’s right, we have more cases for the iPhone 4. Case-Mate is next in line to launch their iPhone 4 Cases. These are definitely eye-popping cases. They make cases for the iPhone 3Gs and BlackBerry and now they will be available for the iPhone 4 with the iPhone 4 Artist Series Original Cases. 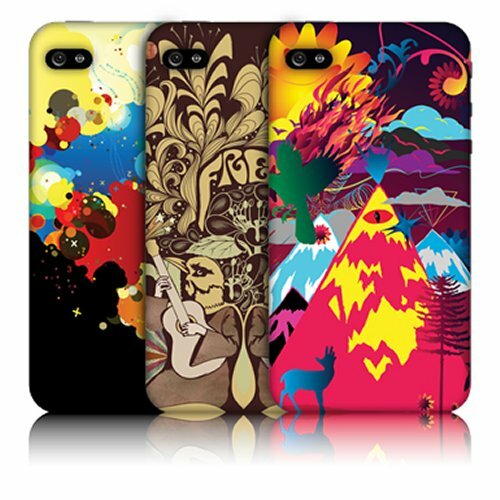 You can design your own custom iPhone 4 case with art from several world-renowned artists. The cases will be available soon to customize any way you want for $39.99. 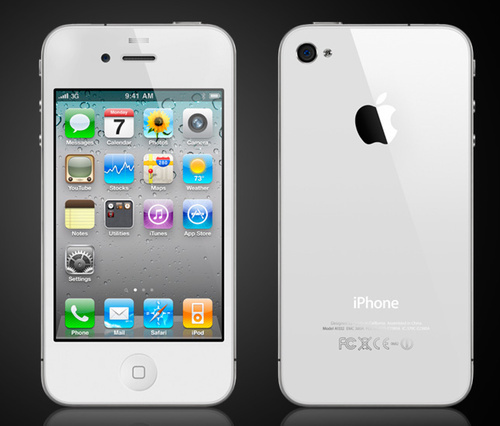 The design on the new iPhone 4 is beautiful, but maybe you want something more natural looking. 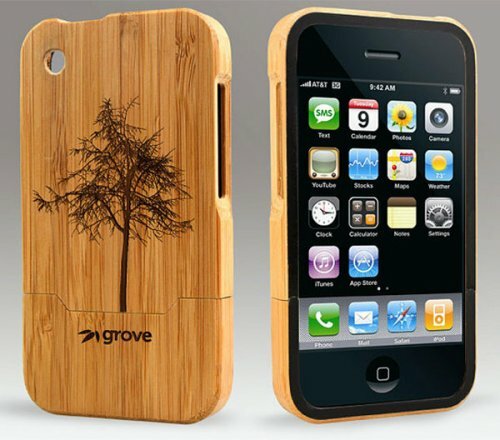 If so then check out these new bamboo cases for the iPhone 4 from Grove Made. This case is available in a plain version, or in some versions with laser engraving. They won’t cost you an arm and a leg either as they can be had for just $49 for the plain version and $69 for the engraved version. HD video recording is one thing, but the iPhone 4 needs a way to edit these recordings on the phone itself. 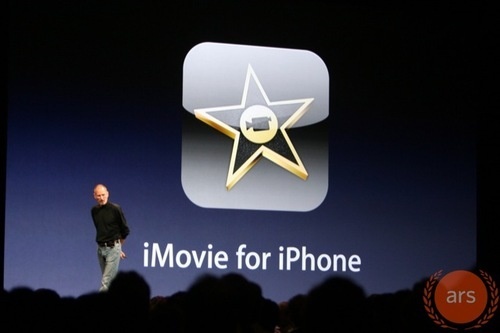 Enter iMovie for iPhone. At last, you can be the Steven Spielberg of the iPhone. Well, maybe not that good. Nothing too fancy here. We are talking video editing on a phone after all, not a desktop. But you can combine various clips, add music, photos, titles and transitions as well as throw in some basic effects. The effects are from the desktop version of iMovie, so you’ll recognize them. You can export in 360p, 540p and 720p. Apple’s latest iPhone is official, complete with an A4 chip inside, just like the iPad. The A4 has a few interconnected chips, like the Cortex-A8 main processor unit with a PowerVR SGX 535, and two low-power 128MB DDR SDRAM chips. This means that they can process things faster while consuming less battery than before since they are connected. The 3.5-inch screen sports a resolution of 960 × 640 pixels. It has four times as many pixels as the current iPhone 3GS’ display. The screen has 326 pixel per inch resolution. Apple is also claiming an 800-to-1 contrast ratio which is four times better than the 3GS.